When we first moved in about 4 1/2 years ago I found this mid-century modern dresser at the Raleigh State Fairgrounds for $85. I liked how much storage it provided and that it was long and narrow, perfect for our smallish bedroom. Having lived with it like this for years, I decided it was time to change it up a little. So outside it went and off to Lowes I went. I needed to pick up some supplies for refinishing it. The first thing on my list was a respirator mask. Every girl needs one in pink right? Secondly I needed belt sand paper in a 150 grit to remove the old stain with my belt sander. Then I needed to pick a stain or paint color. I decided to stain it because as you can see the drawers are snug in their opening and paint would prevent the drawers from closing. I also picked up a pair of eye wear, ear plugs, Minwax polycrylic, and a new paint brush. Before I got to the sanding stage of this project, I first used a Deglosser to remove any greese and top coat. Then off to work I went, using my grandpa's Craftsman belt sander to remove the finish. This process took me about 2 hours to complete. I used a block sander to get in the small grooves on the front and on the feet. Once the dresser was sanded with 150 grit using the belt sander, I used a block sander with 220 grit to finely sand the surface so it was nice and smooth. I used tack cloth to remove all of the dust and then a wet rag to really clean it up. This whole process was enough work for one day. So I let it dry overnight. The next day it was time to stain. I picked Minwax Wood Finish Oil Based Stain in Ebony. Oh and you can get paint sticks for stirring the stain at the hardware store. I forgot to pick some up, so I used a screwdriver instead. I painted the stain on with a synthetic brush and then about 20 minutes later I used some old cloth diapers to wipe off the excess stain. You could also use some plain rags. I waited 8 hours to let the first coat of stain dry and then applied a second coat. You can choose to use one coat, but I wanted a really dark finish. Joe and I had the great idea to store the dresser under our back deck for the night to dry, and knowing there was rain in the forecast we put a tarp over the deck. 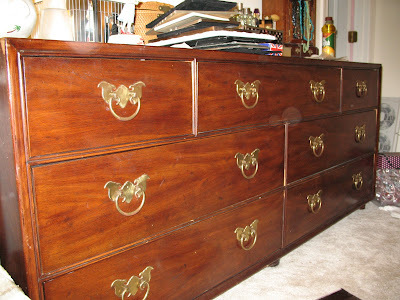 However, to my dismay, the whole top of the dresser and all of the drawers were covered with rain in the morning. So, everything was wiped down and put in the sun for a day to dry. It all came indoors that night and we opened the window and had a fan blowing the air out in case there were still off gases. The rain added a whole day to the project since I wanted to make sure it was all dry before adding the top coat. I used my favorite, Miniwax Polycrylic Protective finish in clear gloss. Here I am applying it with my synthetic brush in very thin coats. Three coats are recommended and you need to sand lightly with 220 grit sandpaper between coats. It takes only 2 hours to dry, so I was able to get all the coats on in a day. However, since I hadn't stained the feet of the dresser yet, I needed to wait until the clear gloss finished drying thoroughly in a 24 hour time period in order to flip it on it's side to stain the feet. I had to wait another 8 hours to apply the Miniwax, so yeah I was pretty tired by this point. The boys were doing some brown painting of their own -except that I think CAP on the right just smeared some pudding on his face to look like MVP on the left, who just normally eats like that. So back in the kitchen, while the feet of the dresser were drying I was able to get started on creating some drawer liners with velvet, ribbon, and gift wrap. Here are my supplies. Note, my shoes in the upper half of the photo. I was getting down and dirty with this part. Oh wait, this was the cleanest part of the project. I measured all of the drawers with my measuring tape and then cut out my paper or velvet to size. 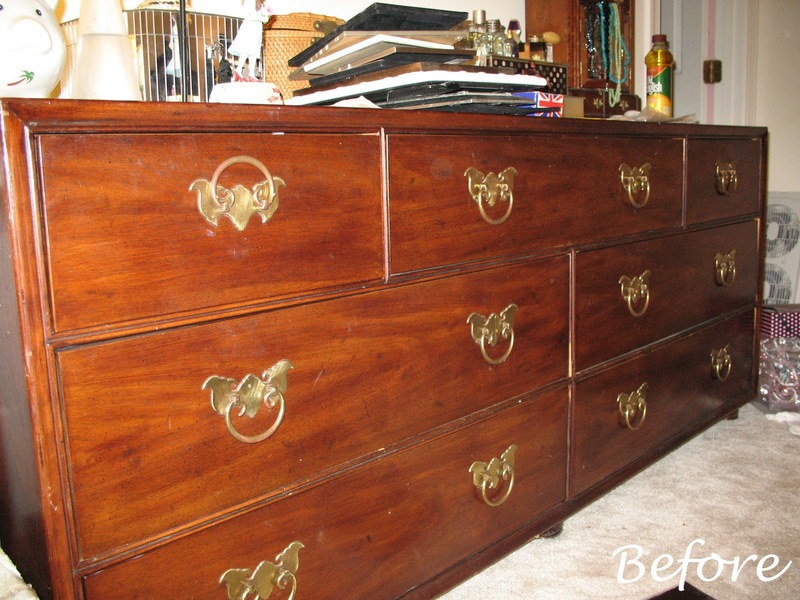 I used Aleene's Crystal Clear Acid Free Tacky Spray to attach the liner to the drawer. You can also use double sided tape, which is probably better if you ever want to remove your liner easily. Oh well. While I measured, cut, and glued my liner in place, Joe was busy measuring where to drill holes for the new hardware. The original hardware had 2" spacing between the screws. I had a very difficult time finding this size hardware anyway, so I opted for bin pulls that were 3" in diameter. These were from an online company called KnobsandHardware and the specific style is called Berenson 938. I had to order 12 total. Shipping was free which is always nice. So Joe measured 1/2" from the original holes and made a mark on where to drill. Another issue that arose, was the depth of the piece that is inserted through the drawer. These truly were bin pulls for kitchen cabinets because they were the same width as our cabinets. So Joe had to do another Lowes run to buy screws that would fit. Apparently the size he bought still needed to be cut down, so Joe used some metal cutters to clip them shorter. We also used washers we already had to go between the screw and the inside of the drawers. Now it was time to drill the holes for the hardware. I tried it, but needed to go do the dishes and clean up the house. Joe took over. After I cleaned up, we were watching our favorite Thursday night shows, Parks and Rec, The Office, 30 Rock, and sadly Community was not on. But Up all Night is pretty good too. After all the drawer pulls were in, we got to set it up the next morning. Ah, and here is the glorious after photo. We Love it. What a lot of difference a little elbow grease makes! I bet you're wondering how I got this shot! I stood on the edge of my bed so you could see the cute drawer liners. I found this teal green velvet liner in the remnant bin at Joann fabrics. So I used it for my lingerie drawer. I used satin ribbon around the edges to give it a finished look. Here is my sock drawer so you can get a closer look at that paper. And I know everyone wants to peak in my underwear drawer so here it is all neatly folded! For a girl who likes power tools, it seems like I have too much pink in there! Well this is normally a lot more than I spend on a project like this, but if you subtract the cost of the things like respirator mask, ear plugs, and paint brush which are invaluable and can be used for many future projects the actual total goes down. It was more like $80 for the whole project. Hope you enjoyed this little dresser makeover! It's one of my most proudest projects so far. So I am dreaming up this new TV Show, kinda like a interior finishing project akin to This Old House where you star as the hostess and hands-on design professional. Any producers out there? BTW- If I heard your grandma say it once I heard her a hundred times: "Just need a little elbow grease" ! Excellent and Inspiring job Cathleen. Very proud of you and Joe for your creativity and industriousness (is that a word?) ! Haha Thanks Mom. You always make me blush. I would give anything to make something out of this blog. Who knows? Maybe some day. Ah, Grandma. I just finished a blog post and mention her in it.